Dr. Timothy Gerhart D.C., D.A.B.C.I., Dipl.Ac.,B.C.N., Founder and Director of Renovare Wellness By Design Natural Health Clinic, has completed a third book entitled: WHY AM I NOT RIGHT SINCE MY CONCUSSION?. The book provides a revolutionary understanding of brain decline post-concussion and effective approaches to support brain healing. It outlines a program with reader- friendly tools to support brain recovery. A reader can learn that one does not have to be knocked unconscious to have a concussion and a first concussion increases risk of a second concussion by 150 percent. Much of our fatigue, anxiety, brain fog, depression, sleep problems, and neuro-degeneration can result from untreated past concussions. Dr.Gerhart has over 30 years of experience teaching physicians and patients how to put together the puzzle of why they suffer with chronic disease, fatigue, poor memory and concentration by getting to the roots of their problems. Dr. Gerhart is a Board-Certified Chiropractic Internist, Diplomate in Acupuncture, and Board Certified in Neurofeedback who has added years of training dedicated to the areas of functional medicine, blood testing, advanced laboratory diagnostics, and brain wave imaging (brain mapping) to better understand the underlying causes of chronic disease and brain decline. Hello I am Dr. Timothy C. Gerhart, D.C., D.A.B.C.I., Dipl. Ac., B.C.N. I am a Chiropractic Physician (D.C.) which I think of as “Doctor of Cause” as well as Doctor of Chiropractic. I am also a Board-certified Chiropractic Internist (Diplomate of the American Board of Chiropractic Internists) and a Diplomate in Acupuncture (the highest level of certification from the International Academy of Medical Acupuncture). Most recently I became the first Chiropractic Internist to become Board Certified in Neurofeedback (BCIA). All of these letters after my name simply represent a life-long love of learning and a continuing journey to expand my knowledge and skill to help people who have suffered for too long. My own personal health struggles with Chronic Fatigue, Pain, Brain Fog, Autoimmune Disease, and Leaky Gut which I share in the beginning of “7 Secrets to Wellness” and my personal concussion story in my 2nd book: “Change Your Brain, Transform Your Life” have been a large motivation to keep learning. Lab evaluation of cellular energetics underlying chronic brain and body problems. A registered acupuncturist with extensive training and 30 years of experience in bioelectric testing and treatment. Author of “7 Secrets to Wellness” available through Vesuvius Press. 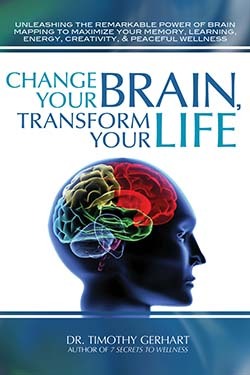 Author of “Change Your Brain, Transform Your Life” available through Vesuvius Press. Founder of Renovare Institute which trains Chiropractic, Medical, Naturopathic, and Osteopathic physicians, as well as Wellness Mentors in Therapeutic Lifestyle Change.